Replying to Pant's 'Good Morning' post on Twitter, Rohit wrote, "Morning buddy. Heard you're a good baby sitter, need one right now. Ritika will be quite happy @RishabPant777." Proud parents Rohit Sharma and Ritika Sajdeh asked India’s talented wicketkeeper-batsman Rishabh Pant to babysit their newborn baby – Samaira. Rohit and his wife Ritika Sajdeh welcomed their first child on December 30 in Mumbai. Soon after the news broke through, the 31-year old batsman left Team India, who is currently on a tour to Down Under to spend some precious time with his family. During the Melbourne Test, when Australia captain Tim Paine offered Pant to babysit his kids during their fun banter on the field, nobody would have ever thought that this could be true. 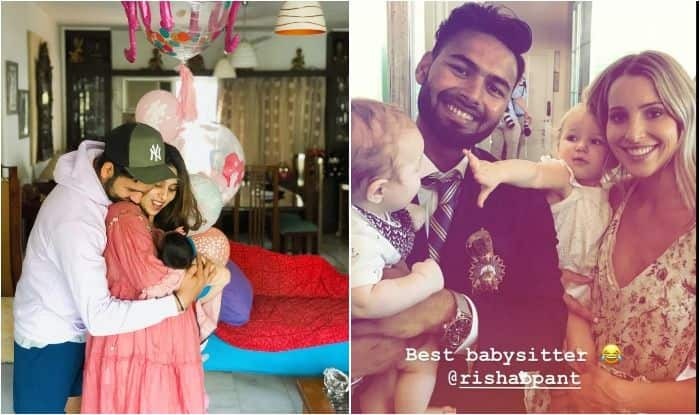 The on-field banter was taken way too seriously by Paine’s wife Bonnie as she posted a picture captioned “Best Babysitter” of the Indian wicket-keeper with her kids. Meanwhile, the star batsman finally gave a glimpse of his new-born baby to all his fans without revealing her face on his official Twitter handle. Rohit posted the picture of the baby duly holding its mother Ritika’s hand and also his hand. Along with the picture, Rohit also wished his fans on the start of the new year. “Well hello world! Let’s all have a great 2019,” wrote Rohit with the much-awaited picture.